82 year old, Bobby Rush is as vital today as he was in the 1950s, performing with Jimmy Reed, Muddy Waters, and Etta James. His new release, Porcupine Meat, on Rounder Records, proves, beyond doubt, that the Blues Hall of Famer hasn’t lost a step. As funky as he wants to be, Rush first exploded onto the R&B charts 45 years ago with his hit song, “Chicken Heads,” and hasn’t looked back since. He’s recorded for a myriad of labels, including his own Deep Rush Records. He’s also garnered three Grammy nominations, ten Blues Music Awards, and a spot in the Rhythm & Blues Music Hall of Fame in Clarksdale, Mississippi. Not too shabby for a guy from Homer, Louisiana that started making music on a syrup bucket and broom wire diddley bow in the late 1930s. 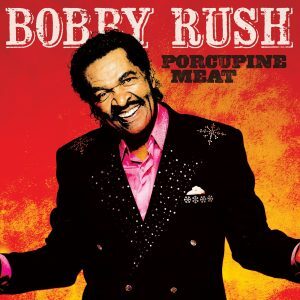 At a time when the sounds of Southern Soul are making a huge comeback in the music world, Porcupine Meat is a not-so-subtle reminder that Bobby Rush has been performing it the entire time, and is still one of the best in the business. Recorded in New Orleans with producer, Scott Billington, at the helm, we are given 12 original tracks, replete with the funk slathered music and double entendre filled lyrics that have made Rush a legend. It all kicks off with, “I Don’t Want Nobody Hanging Around.” The down and dirty bass licks provided by Cornell Williams, along with Rush, himself, on harmonica, let us know off the rip that we need to buckle up; its going to be a helluva ride. Vasti Jackson‘s primo guitar work is a wonderful addition. This album isn’t all fun and games however. “Got Me Accused,” is a slow, riveting, blues ballad that speaks of the very relevant topic of injustice. With lyrics that include, “This could be the last time you see me,” we can’t help but wonder if Rush may also be looking back over his 60+ year career and, perhaps, pondering his own mortality. Our favorite track on this release is “I’m Tired (Tangle Eye Mix),” which is the perfect closer for this prodigious album. Brilliantly recorded with Rush playing both rhythm and lead harmonica parts, this song wraps it all up in fine fashion. A gang of New Orleans session players, including a five-piece horn section, bring out the brilliance in Rush’s songwriting abilities and make for an overall outstanding album. If Bobby has slowed down, even a little bit, you can’t tell it by his performance on this project. This is one that every blues, funk, r&b, or soul lover will cherish.